Authors are sometimes asked if they’re interested in reading a manuscript and providing a quote for the cover. This can be a fraught business, you can imagine! 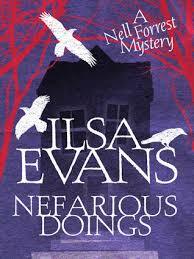 But last year I was asked to read Nefarious Doings by Ilsa Evans – the first instalment of her new Nell Forrest Mystery series – and I was sold from the very first page. I have since been telling anyone who would listen how much I enjoyed it. So I am very excited that Ilsa agreed to join me for a conversation today! Ilsa, you have managed to seamlessly blend what we love about contemporary women's fiction - warm, relatable characters, everyday life, a good dash of humour, even a touch of romance - with murder, mystery and intrigue ... So I have to ask, what made you veer into this territory? I think that I've written across genre a little bit in the past, which may have been to my detriment. One minute I'll write something quite light and then I'll lurch into the story of an abused woman, or euthanasia or something like that. And I started thinking how nice it would be to identify - and be identified with - a certain genre. Then one evening I was watching the marvellous Phryne Fisher on the ABC, and had a bit of an epiphany. Murder mystery seemed like a marvellous challenge, plus it was a genre that allowed me to retain characters. I find it terribly difficult to say goodbye to characters at the end of my books. For weeks after I finish writing, I feel like I should be able to pick up the phone and invite them around for a drink. With murder mystery, I get to catch up with them every few months! What a great answer! This happens to me too, and my readers are always asking for sequels, but my stories don't really allow for that. Your Nell is such a wonderful character - I know I couldn't wait to spend more time with her after I read Nefarious Doings, so I was thrilled when Ill-Gotten Gains was released soon after. I realise this could be one of those 'Where do you get your ideas' questions that are impossible to answer, but – how did you come up with Nell? Most of my main characters are people I would like to know. I'm fine with having unpleasant or annoying or odd types in the background, but the main ones have to be someone I'd enjoy spending time with. Because that's exactly what I have to do! In Nell's case, I was busy with another project when I first came up with the murder mystery idea so she had to bide her time for a few months. By the time I finally put pen to paper, she was fully formed - and getting very impatient! I don't actually recall making any definitive decisions about her personality or family or even her job; they all just seemed right. Incidentally, I recently read your The Right Time and I think Nell would get on very well with Ellen. I think you're absolutely right! They're both that kind of no-nonsense woman, pulled in all directions by kids and work and all the other ephemera of life, and wondering where they fit into the mix. Nell did appear fully formed, I felt like I already knew her from the start - which is a great characteristic to have in your lead. And taking a character like that, and putting her on the scent of a mystery, was a stroke of genius. My dad is always asking me when I'll write a crime into one of my books, but my head just doesn't work that way, unfortunately! Did you have to plot out the entire mystery, so you knew where it was going? Or did you start with an idea, and let it unfold? It's funny you should ask that because I'm getting towards the end of the third book in the series and have just realised I've tied myself in knots (figuratively speaking). And the knots have a lot of loose ends also, sticking out left, right and centre. It's like a cross between macrame and writing. Not good. So no, generally I start with an idea and just let it unfold but perhaps I need to start rethinking that approach! You may well have to! I've always been a little dubious about crime writers who claim they don't know whodunnit until it comes out in the writing. However, it must be both exciting and daunting to stretch your author muscles. You’ve kind of answered my next question: that you’re working on a third book in the series (Yay!). How many books do you think Nell has in her? Or do you have other plans after this? The third book is called Forbidden Fruits and I'm just now finishing it off. I'd love for there to be more - and have ideas for at least another three! - but I really have to wait and see how they're going. The reviews have been great but I've just heard that the print editions have been postponed so that's not good. It's all rather up in the air unfortunately. Although I do know that next I'll spend some time on a project I started under contract a few years ago, but then the contract fell through so I shelved it. It's a light, non-fiction exploration of middle-age for women, called 'The Invisible Woman and other remarkable phenomena of middle-age.' I'm actually looking forward to dragging it out and dusting it off! And as an invisible middle-aged woman myself, I'll look forward to reading it! If it's executed with the same warmth and humour as your Nell Forrest series, then it will be a must-read. Thanks so much for the conversation, Ilsa!